Can be delivered Wednesday, 24 April using our Overnight Service if ordered at anytime during the next 4 days, 5 hours and 30 minutes! This realistic looking grass has been improved with a denser and closer feel. New for 2018 is the introduction of this popular grass in 3m wide roll widths, now its possible to keep waste material to a minimum as well as the price. 20mm total height product that needs no sand dressing due to its close, natural, hard wearing pile. 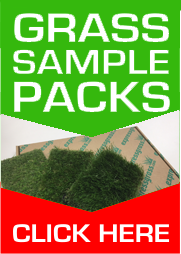 Made up of three natural green colours giving the appearance of grass in different states of growth and wear, making it one of the most realistic and natural grass's in its price range. At just 11.99m2 it offers outstanding value for money.